We offer the complete range of PADI TecRec courses, plus a selection of programs from other agencies such as RAID, SSI, GUE and TDI. For information on prices please click here, all of our programs include course materials, the use of equipment, dives, air and nitrox. Our cave, wreck and DPV programs may also require the addition of instructor travel expenses, please ask us for a personal quotation. Not included, Helium (where needed) and Sofnalime (CCR and SCR). We take a great deal of pride in these programs and want you to get as much from them as possible. With that in mind anyone who completes a certification technical program (tec 40,45,50 etc), including instructor programs, is welcome to join any future course we run. We do not charge you any courses fees for this, classroom sessions are free, for dives we only ask you to cover costs. This way you can be sure we put our very best into any program we conduct, and you can attain the level of knowledge and skill you hoped for. Great for those of you who are not sure if you will enjoy diving with twin tanks, this program includes a thorough briefing on the configuration from your instructor, fitting the equipment, a basic skill circuit and safety drills, followed by a dive on one of our local sites. If you enjoy it and wish to continue this can be credited to your Tec 40 Course. Ideal for those who are curious about the configuration and would like to give it a go. Sidemount consists of two completely independent tanks, valves and regulators streamlined along your torso. This configuration is ideal for those with ambitions to tackle cavern, wreck or cave environments later. This program includes a thorough briefing on the configuration from your instructor, fitting the equipment, a basic skill circuit and safety drills, followed by a dive on one of our local sites. If you enjoy it and wish to continue this can be credited to your Tec or Recreational Sidemount Course. This non certification program is ideal for anyone who is curious about this technology or what it feels like to dive silently with no bubbles. During this program you will learn about the primary differences between open and closed circuit diving, two CCR types and how they are used, and get to try one on a dive. The first of PADIs technical diver certifications, this course will take you through the proper use of technical diving equipment, dive planning using desktop decompression software and the motor skills and techniques required for Tec diving. You will be certified to plan and execute limited decompression dives. This introduces the sidemount configuration, along with the proper use of decompression cylinders set up for sidemount. The course contains simulated decompression procedures, this makes it suitable for Technical Divers wishing to cross over to this configuration, or non-tec divers to be trained both in proper use of sidemount, and practice some basic decompression procedures. Note that Tec Sidemount may be combined with PADI Tec 40, 45 or 50, please ask us for more information. The second of PADI’s Tec diver programs trains divers with the procedures and knowledge to plan and execute dives to 45 meters. 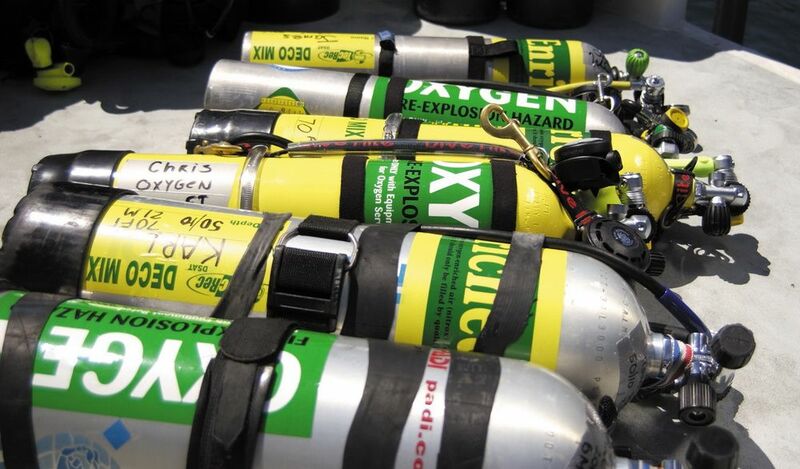 This course extends the divers limits in terms of depth, dive time and additional decompression gases. Skills learned during level 1 will be further refined, and basic technical diver rescue techniques are covered. Tec50 introduces accelerated decompression, switching between high oxygen breathing gases during the ascent to shorten the required decompression time. This increases your range considerably. During this course you will be using up to three breathing gases during a dive, two of which are used for decompression. The gas blender course is an ideal accompaniment to any technical diver course, during these programs you learn not only how to blend gas, but more about oxygen service, compatibility and cleaning. You will develop an understanding of several blending systems, and get to blend your own gas used for the course. The program has the option to be certified as a EANx Blender, or EANx and Trimix blender. During this program you will be trained to use gas blends containing helium to extend your depth range to 65 meters and use EANx and oxygen for accelerated decompression. This is the first level of PADIs Trimix training, qualifying you to use normoxic gases containing 18% or more oxygen. You will be trained to dive to depths of up to 90 meters using Hypoxic and normoxic gas blends, the full operating potential of these gases is not yet fully understood and continues to be explored. This is the second level of PADIs Trimix training, qualifying you to use hypoxic gases containing less than 18% oxygen. This courses provides the diver with an introduction to overhead environment planning, skills and dive execution. All of this is done within the light zone of a cavern to remove the additional stress that would come with being beyond it. Heavy emphasis is placed on proper gas management, gas loss drills, line work and effective communication is low light environments. Intro to Cave – Considered by many as the most challenging of dive environments, cave diving requires a lot of the candidate. During this course you will build on what you learned during your cavern training and refine those skills further. As you move out of the light zone, proper planning, gas management, a high level of motor skill and control is required. Also addressed in this program are physiological topics such as situational awareness, analytical thinking, problem resolution and stress management. Full Cave – Builds on what you learned in cave level 1 and extends your range by introducing stage tanks and line jumps. This opens the door to some incredible dives, in some very challenging environments, naturally the entry and passing requirements are high, expect to be challenged. Advanced wreck is for technical divers that wish to explore submerged wrecks beyond the light zone, and dive beyond no decompression limits. A heavy emphasis is placed on team diving, effective planning and gas management, basic surveying techniques, line work and emergency procedures. This program is intended to challenge you. We teach this course on the San Juan wreck located in Liloan, Cebu City. There will be additional costs for instructor travel expenses. At least 2 of these dives will be done on Trimix, there will be some additional costs for Helium. The goal of the course is to develop the skills taught during the Rescue Diver course to a very high level and relate them specifically to the hazards, equipment and techniques encountered during technical diving in open water. In addition, this course will teach technical divers how to conduct technical diving risk assessments and how to prepare effective emergency plans. Tec Instructor is PADI’s first instructor level for teaching their Tec Rec courses, as a tec Instructor you will be able to teach the PADI Tec 40 program. If you would like to be able to teach Tec 40, 45 and 50 please see the Tec Rec (Tec Deep) instructor program below. Taught in a familiar Instructor Development Course (IDC) style this program will help you develop a thorough understanding of the standards, procedures and instructional tools used to conduct these programs. You will learn how to present skills in the classroom, confined and open water. Tec Rec/Tec Deep Instructor are able to independently conduct the Tec 40, Tec 45 and Tec 50 programs. This is the perfect certification for those who are ready for the challenge of educating Tec divers to a very high level and joining the ranks of an elite group of instructors offering these courses. Taught in a familiar Instructor Development Course (IDC) style this program will help you develop a thorough understanding of the standards, procedures and instructional tools used to conduct these programs. You will learn how to present skills in the classroom, confined and open water. Taught in a familiar Instructor Development Course (IDC) style this program will help you develop a thorough understanding of the standards, procedures and instructional tools used to conduct these programs. You will learn how to present skills in the classroom, confined and open water. Have assisted with at least on Tec Trimix course (conducted during your training with us). During this program you will develop a thorough understanding of the standards, procedures and instructional tools required to teach the Tec sidemount course. You will participate in workshops covering classroom presentations, practical application and in-water training. Logged at least 100 dives, of which 20 dives were made with EANx, 25 deeper than 18 meters, and at least 15 were deeper than 30 meters. Once the exclusive domain of experienced technical divers SCR and CCR technology is advancing at a rapid rate, and as a result is becoming easier to use and very safe. Now opportunities exist for both Technical and Recreational divers to use these exciting tools. Courses are very much unit specific, they differ in design and application a great deal from one model to another. We work with some very talented instructors that can provide instruction on a variety of machines, some examples being the Poseidon MK 6 and Se7en, AP Inspiration, Pelagian MCCR, the SF2 Sidemount CCR, The JJ, Hammerhead and Revo. If you are interested to go silent and no bubbles, provide us some information on your diving experience, certifications and goals, we can come back to you with a recommendation and training path. Prerequisites for these programs vary depending on your training goals.